Less than half a year after a man connected to the investigation of Aaron Hernandez was killed in a car crash before being questioned, the passenger in that crash – who was interviewed in the case – also has died. Tabitha Perry, 27, who was interviewed by Massachusetts police as they investigated the June 17 murder of Odin Lloyd, died Monday in Connecticut, according to the Hartford Courant. 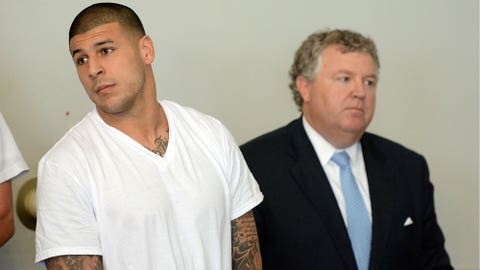 Perry was friends with people associated with Hernandez, the former New England Patriots tight end who has been charged with first-degree murder in Lloyd’s death. Perry’s death is not being considered suspicious by police, according to the Courant. But the fact that she’s connected to the case and is the third person tied in some way to Hernandez to die since the investigation began is drawing attention. Perry was in the car with Thaddeus Singleton III when he was killed June 30 in what was ruled an accident. Singleton and Perry had a child together, although Singleton was married to Tanya Singleton, Hernandez’s cousin. An uncle of Hernandez also died this year in a moped crash. Singleton has been called the "nexus" of Hernandez’s Bristol connections, according to the Courant. Perry was found unconscious and not breathing when police were called to a residence in Southington, Conn., on Monday, according to the Courant. Toxicology test results are pending.